One project of the Spring has been to revise Burton W. Barber's famous Church Historically Traced chart. A group of Burton's friends assisted with the revision. The chart had doubled as a tool to teach Revelation, but we removed most of those references. The purpose of the revision has been to make a tool for use with those just learning about the flow of church history. A section was added to the chart showing the year 2000 and the written portion was brought up to the present. A crossword puzzle was added on the final page so the user could dig into the explanation easier. The chart can be downloaded from this link. Charlotte (now Bergerson) grew up, married and now writes for Warrenton’s Columbia Press. Ken Shoop spotted the reference to the Reymans in a May 2006 issue. She says, “I was kept under strict rules at Harold and Imogene’s house.” She tells how grateful she was that the Reymans were willing to make a home for her so she could go to school in Warrenton where her friends were. Our kindness and examples may last a lifetime - and beyond. Lois and I just returned from having a leisurely breakfast on the Columbia River with our three wonderful daughters. Carol came in from Tampa and Bonnie from Seattle. Joy lives here in Vancouver. It is such delight to spend time with three wonderful and accomplished ladies. We bask in the results of raising children in church, of having rules for the home and modeling a lifestyle that centers on the Lord. Each daughter is different, but all have, like their mother, a servant’s heart, putting others first. My friend Matt, though unsighted, has some great insights. He has given permission to use this respectful parody of President Abraham Lincoln’s Gettysburg Address. Twenty centuries ago, our Heavenly Father brought forth to this planet His only begotten son, to be crucified so that all men might be saved. Now we are engaged in a great Christian war...testing whether our faith, so conceived and so dedicated, can endure. We are met by Him so that we might receive strength and victory over death. We have come to partake of this Lord’s Supper because He died, was buried and rose again that we might live. It is altogether fitting and holy that we should do this. But, in a larger sense, we can not dedicate...we can not consecrate...we can not hallow this table. Jesus has already accomplished that for us. It is far above our poor power to add or detract anything from communion. The world will little note, nor long remember, what we say here, but it can never forget what He did. It is for us the living, rather, to be dedicated here to the unfinished work which our Lord so nobly began. It is rather for us to be here dedicated to the great task remaining before us...that from His sacrificial death we take increased devotion to that cause for which He gave the last full measure of devotion...that we here highly resolve that He shall not have died in vain...that this Gospel shall have a new birth of freedom: the cleansing and renewing of His grace, by His blood and for our forgiveness. Thanks be to God we shall not perish but have eternal life. King David of Bible fame said, "Let the words of my mouth and the meditations of my heart be acceptable in Thy sight, O Lord." The words were appropriate then and mean even more now that blogging is here. For those still in technology training, a blog is like a public diary on the internet. It is read by friends. It can also be read from Sian, China or Nairobi, Kenya. MySpace alone has 70 million bloggers in 2006, 15 million of them between 14 and 18 years of age. Blogs are not private. They can be easily accessed by parents, police and job recruiters. Radio financial guru Clark Howard says that all corporate recruiters Google for job applicant’s history on the Internet. A job applicant may have a fine resume, but their blog may show an unsavory side not in the resume. If a bad side is seen, there will be no job offer. A few poorly chosen words while we’re teens may keep us working in minimum wage jobs for years. Being 15 or 18 is not a phase we pass through on the way to real life. It IS real life and we need to live it carefully and correctly now. This blog stuff is permanent. Today it’s MySpace and Facebook. Other social networking sites will become popular soon. More than ten years ago I wrote on different discussion groups and sometimes those comments still come up during a search. The comments were ok, but it is alarming to realize that the internet comments are so permanent. So the bottom line is this: The Lord forgives us when we ask, but the Internet cannot forget. Say it carefully the first time. We’ve known Marian McCuistion since Bible College days, more than 55 years ago. She is the servant type, always helping others. 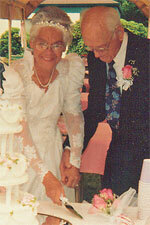 Now at 80, she has married an acquaintance of ours – Ruben Ratzlaff. He’s right at 90. He taught at San Jose Christian College for 39 years. It’s her first marriage but his third. Two earlier wives have died. The wedding was no quickie for Marian. She had the whole show. She was a June bride, married at the Turner, Oregon Christian Church. There was the invitation list, rings, pink and white flowers, the special music, the photographer, the three-tiered cake, and white satin gown. Evaline Hendrickson reported the wedding was sweet and beautiful and the "bride was happy as a lark." The honeymoon is at Lincoln City on the Oregon Coast. May God grant them years of companionship and joy. July 20 update: I asked Marian if she liked the institution of marriage and she was very positive in her answer. It's been enjoyable and a laugh-a-minute. I've been reading a book to my beloved Lois. It's Home to Harmony by Philip Gulley. The author has captured the essence of small town America and a small town church. The story lets us remember back to people we knew who were like Gulley's fictitious folks. Memories can be such fun! Our thanks to Stephen Lord for the recommendation. Your community library may have a copy.